Watersheds are composed of all the land and surface water areas that drain to a given point on a stream or river. They often define the geographic scope for hydrologic or water resource studies and provide the boundaries for aggregated data such as stream networks and the land characteristics that affect water flow and water quality. State Watershed Data: The primary producer of statewide watershed data is the Minnesota Department of Natural Resources. DNR has maintained and improved statewide watershed data sets since its original 1979 Watershed Mapping Project. Many people are familiar with and have long used the "DNR Major Watersheds" and "DNR Minor Watersheds" datasets. In 1998 DNR began a statewide re-mapping of watersheds, down to the level of mapping drainage areas of all lakes greater than 100 acres. The base watershed delineation developed for this "modern" dataset is called "DNR Catchments," and is the foundation layer from which all of Modern DNR watershed layers are derived. DNR Catchments are also used to derive the state's portion of the federal Watershed Boundary Dataset. DNR Catchments were published for distribution in 2008, and new DNR Major Watershed and DNR Minor Watershed files were published in 2009. To eliminate confusion between modern and legacy datasets, DNR stopped distributing the historical DNR Major and Minor Watershed datasets as of July 1, 2010. HUC Level 02 defines large drainage regions such as the Upper Mississippi (07), the Missouri (10), or the Great Lakes (04). HUC Level 08 defines drainage units that are at the level of the familiar 'DNR Major Watersheds', for example, the Redwood River and the St. Louis River. HUC Level 12 defines the smallest federal drainage units, for example, Minnehaha Creek (070102060605). These still define larger areas than the DNR Catchments. 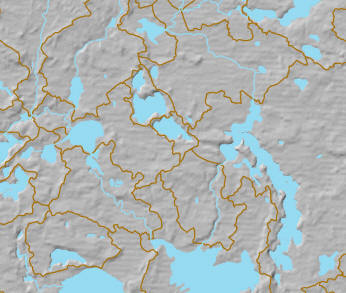 The Watershed Boundary Dataset has been incorporated into the National Hydrography Dataset as the base hydrologic unit boundaries for NHD hydrography features. In Minnesota, the DNR Catchments layer was used to derive the WBD Delineations. Modern Watershed Data: Recently published watershed datasets that are considered state-of-the-art. Legacy Watershed Data: Statewide watershed datasets that were formerly in wide use. This section provides a translation between legacy dataset names and modern dataset names. Legacy data are still available from the distributor upon request. General Information: Background information about watersheds and watershed delineation. This webpage describes the modern Minnesota DNR Watershed Delineation Project (formerly known as the 'Lakeshed project'). The project was started in 1998 to define watershed boundaries for all lakes in the state 100 acres or larger, and to update existing watershed boundaries using the latest GIS data available. Completed in 2009, this project created the new base-level DNR Catchments dataset as well as revised versions of the legacy DNR Major and Minor Watersheds (see next entry for data links). DNR Catchments are the smallest delineated and digitized drainage area mapped by the Minnesota DNR Watershed Delineation Project. Catchment boundaries are aggregated to form other DNR Watershed distribution layers, such as the modern DNR Major and Minor Watersheds. All of these watershed delineations are nested, with Catchments being the smallest unit. The Catchments layer was also used to derive the state's WBD (see next entry). This is the main webpage that describes the national framework watershed dataset completed by NRCS and USGS, with assistance from states. The WBD is a set of nested administrative watershed boundaries at six levels of detail (HUC 02 to HUC 12) that describe progressively smaller drainage areas. This webpage contains links to data description and history, federal watershed delineation and attribution standards, and data downloads. This dataset depicts watershed district and watershed management organization boundaries in Minnesota. Watershed districts and management organizations are special governmental units created to address water management issues such as flood control, stream channel improvements, water conservation, drainage system management, sediment control, riparian area management, and water quality. StreamStats is a web-based GIS application that provides users with access to analytical tools useful for water planning and management. Based on the ESRI ArcHydro data model and tools, StreamStats enables users to obtain streamflow statistics, watershed characteristics, and descriptive information for USGS stream gage stations and user-selected ungaged sites. Each state is implemented as a separate application. Minnesota's StreamStats went online in 2009. A StreamStats Fact Sheet is also available. StreamStats replaces the USGS "Minnesota Interactive Watersheds" application. Watershed Boundary Dataset (WBD) contains all of these nested levels of delineation, plus HUC Level 10 and HUC Level 12, in a single dataset. Available from NRCS WBD data download page (select area of interest); also delivered as part of NHD Model 2.0 data downloads. Watersheds, NRCS, 1999 (MnGeo) - nrcsws99 also known as NRCS 11-digit HUC WBD HUC Level 10 replaces the legacy HUC-11 file since it delineates watershed units of about the same size. DNR's main webpage for watershed information. It defines the concept of watersheds, explains why they are important, provides a watershed health assessment tool, and provides links to local, state and national watershed standardization and delineation efforts. A standard developed to provide a common convention for identifying watersheds in Minnesota. It is intended to promote data integration within the state as well with the national framework Watershed Boundary Dataset. This page links to maps and descriptions of the 10 major drainage basins and their constituent watersheds in Minnesota. The PCA uses a basin-based approach to water quality protection and restoration. A web portal to internet-based decision support information for the Red River Basin, including GIS data links, static maps, high resolution digital data and a Flood Forecast Display Tool. This link is to a clearinghouse of data about the Minnesota River Basin. The data is intended to be used for natural resource planning and education purposes within the 37 counties that make up the river's drainage area.